I’ve been using a BlackBerry since 2005. I got hooked as part of the “CrackBerry” generation in Washington, DC, and have gone through track wheels, scroll pads, and now touch screens. 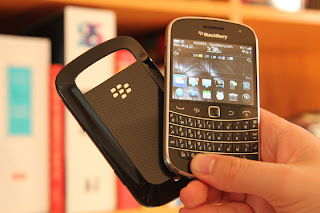 I currently have the Bold 9930. Why am I such a “sucker”? To be sure, I’d be thrilled to get an iPhone. It’s gorgeous. The app ecosystem is unparalleled. And the integration with iCloud and my iPad is tantalizing. Yet I can’t make the leap for one simple reason: the BlackBerry’s physical keypad is as good as it gets. For someone like me, who uses a smartphone primarily for email, the ability to type both quickly and accurately is paramount. When I type, I need to focus on what I’m saying, rather than on whether I’m making typos. The BlackBerry’s spacious and soft keys allow me to do this—without looking in fact—in a way that I just haven’t found possible with a touchscreen keypad. Also, I’m not a fan of unorthodox capitalization or abbreviations, both of which are more common on phones with a physical keypad. I want full control over my words. Sure, it’d be wonderful to have a bigger screen, a better camera, more apps, and so on. And carrying a BlackBerry these days is like using an AOL email address: it marks you as dated and uncool. But I use my smartphone primarily for work, and when I need to fire off an urgent email or craft a long message while stuck on the subway, I have full confidence that my BlackBerry will facilitate these mission-critical tasks. Addendum (9/17/2012): I had so much fun writing this that I turned it into a blog post. Addendum (9/19/2012): Success (see page 44)!